Flexible Flat Cable | Judd Wire Inc. Flexible Flat Cable (FFC) is the main Flat Component product line. FFC offers lightweight and space savings over traditional wire harness designs. SUMI-CARD® is produced in five factories located in four worldwide locations to support our customers globally. TheSEI Group has R&D functions strategically located in Japan and provides updated technology to each factory. Judd Wire services North and South America by supplying and supporting SUMI-CARD® consumer electronics and automotive electronics customers. 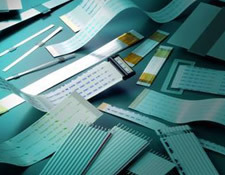 Other examples of Judd Wire Flat Component product applications in North America include: clock spring cable designs for automotive airbag systems and TAB-LEAD for film type Lithium ion battery designs. As of July 31, 2007 all Flat Component products are in accordance with RoHS.